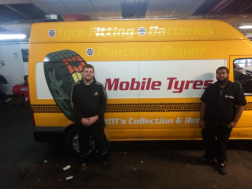 K B S Tyres is proud to provide a range of services including MOT testing, servicing and repairs for people throughout Staffordshire. We are a customer-focused garage and that’s why we offer our services at a competitive price that beats main dealerships. we offer a 1 ramp workshop catering for all makes/models & repairs. Our customers time is important to us and that's why we aim to work in a timely manner to get you back on the road as soon as possible. I was able to book the MOT at very short notice. The car was picked up promptly/early and the test was completed by 12:15. The car failed it's MOT on two items - one was a fuel cap that they could not order from their supplier so the car was returned without either repair. Had to book car in to another garage for the repairs and then return the car back for the re-test. I was a little disappointed that the garage was unable to source the part, I've never come across this. I paid more for the MOT due to needing to book a short notice MOT and wanting the convenience of a one stop valet service. Unfortunately my car will now have been in the garage 3 times over a period of 7 days. In terms of service, if it had passed / been repaired I would have been delighted - due to the difficulties being able to source a fuel cap I'm disappointed. This may be more of an issue with the supplier than the garage; when I informed the garage completing the repairs re: the fuel cap they simply said that if this was the case with their supplier they would source the part from Vauxhall. Very easy to talk to, he explained everything to me, and was very patient in answering my questions. Would definitely recommend him.